Just after my daughter’s first birthday, my little family and I moved from our first little one-story home into a larger, two-story home. We were excited about gaining more space and watching our daughter grow up in this new home; however, what I wasn’t prepared for was how utterly terrifying it is to watch your newly walking toddler try to navigate steep stairs. The minute we moved into our new house, I went on a hunt for a baby gate and was dismayed to find that they were all really, really ugly and many did not work with our type of staircase. I was greatly disappointed in my options, but we settled for the baby gate that got the best reviews, even though it was unsightly and did not attach to our staircase well at all (which posed a serious injury risk for my ever-curious toddler). Fast forward a couple of years and we are moving again. This time, our baby girl has mastered the stairs, but our new son did not handle stairs well (he had fallen down them already and my mama heart couldn’t survive watching that happen again). This new house had a staircase that would not allow a standard baby gate, so once again I went on a hunt for options. All of the ugly, metal gates were all still available, but this time I was pleasantly surprised to find a new option at my disposal. And this new option was not only attractive, it was versatile and safe! 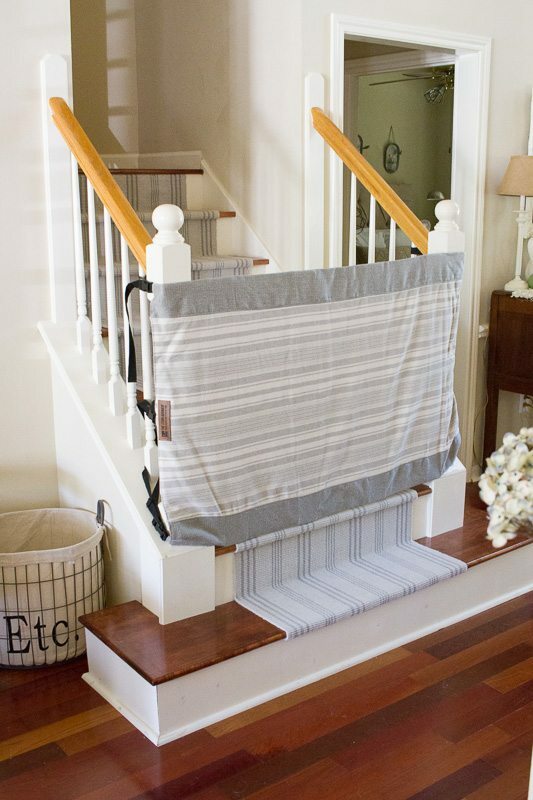 Friends, let me introduce you to every mom’s new best baby gate option: The Stair Barrier. What is The Stair Barrier? 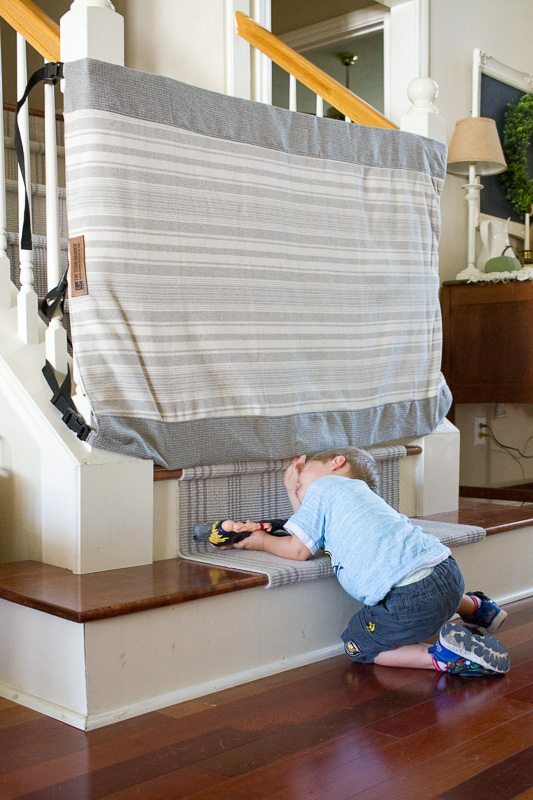 The Stair Barrier was created by a Michigan mom who, like me, was tired of finding nothing but ugly, poorly constructed, one-size-fits-all baby gates. She dreamed of a baby gate that would keep her kids and pets off of the stairs in her home, but also one that was attractive and easy to use. When she couldn’t find what she was looking for, she decided to make her own (now that is a girl after my own heart!). 1. The Stair Barrier is safe, customizable and attractive. The Stair Barrier is specifically designed to be used at the bottom of the stairs and to keep kids and pets from going up the stairs. Stair Barriers come in a variety of attractive, well made fabrics; there are so many choices, it would be hard not to find one that looks great in your home! They also come in custom sizes so that even if you have an extra wide stair case, you can find a Stair Barrier that will fit your specific space. 2. It is easy to install with little to no drilling. With the banister-to-banister version of the Stair Barrier, no drilling is required. You simply secure the straps around your banisters and you’re good to go! With the banister-to-wall option, you will need minimal drilling to install hardware on the wall side. 3. It is strong and sturdy. Stair Barriers are designed using interior vertical struts and horizontal webbing so there is no bar for kids and pets to climb. The interior structure of the gates are also strong enough that your clever kids (or burrowing pets) can’t lift up the bottom! 4. It is lightweight and portable. The banister-to-banister gate can easily be removed, rolled up and stored away or taken with you when you stay at the in-law’s house. The banister-to-wall gate can be rolled up and secured to the wall side, keeping it neatly out of the way if you need it to be. 5. And, it is made in America. The Stair Barrier is made right here in America with American-made materials. The creator of the Stair Barrier believes it is important to be able to oversee every aspect of her product and make sure each and every one lives up to her high standards! *Bonus: it is made with recycled materials. I love this fact about The Stair Barrier! A majority of their products are made using Repreve, a special fabric made by recycled water bottles. It is important for the folks at The Stair Barrier to make sure their product is not only beautiful, but sustainable and environmentally friendly! Where Do I Find The Stair Barrier? The Stair Barrier can be found just about anywhere you shop! You can order on their website, or at third-party retailers like Amazon, Hayneedle, Wayfair, Nordstrom, Walmart and Zulily! As you can see, my Stair Barrier is put to good use on a daily basis. 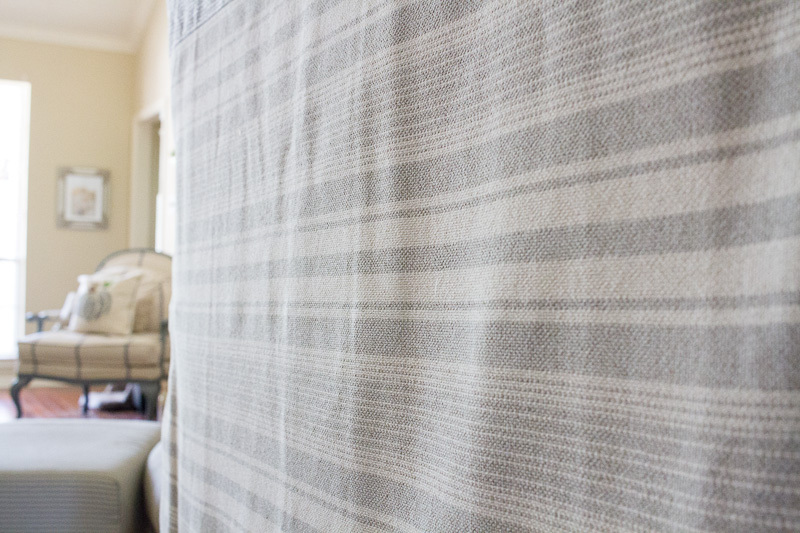 I love the way it matches my decor so it’s not such an eyesore (it even matches my stair runner really well!). My little guy is getting better at navigating the stairs on his own, but I still don’t like him being unsupervised on the stairs just yet. Also, my silly dog thinks he needs to check on the kids while they’re napping so if I don’t have my Stair Barrier in place, he will go up and down the stairs at least 40 times in the span of two hours. Not only does his constant barreling up the stairs annoy me, I’m afraid it’ll wake up the kids (and that would be disaster, am I right?!). So I keep my Stair Barrier in place to keep him downstairs with boring ol’ mom while the kiddos nap. Poor dog. If you are in the market for a phenomenal baby gate, you have got to check out The Stair Barrier! I will never buy one of those ugly metal death traps again thanks to this beautiful and innovative product.